Tee up some fun with this golf-inspired dartboard game. With this golf-inspired dartboard game, you'll never need a caddy or have to guess the right club for the shot. 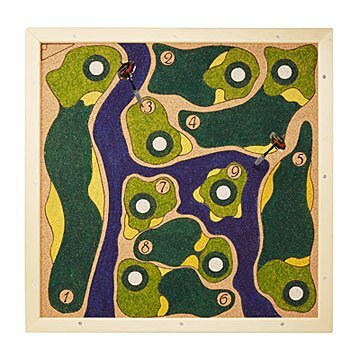 The nine-hole links can be adapted to beginner, intermediate, or advanced skill levels, so dart duffers and pros can play in the same game. Each missed shot lets the player move closer to the board for a better chance of hitting the hole. But watch out for sand traps and water hazards that will add a one-stroke penalty. A hole-in-one gift for golf and dart lovers alike, the set comes with three darts and game instructions. Handmade by Jay Stoltz in Roanoke, Virginia. The product looks exactly as pictured. The darts seemed to be a very good quality. It hasn't had much use yet, so I can't speak to the quality too much. Beautiful product with a swift delivery. Great idea for bar game to be enjoyed by all!